Maïtagaria is situated in the heart of the famous surfing town of Biarritz, just 200 metres from the lively Place Clemenceau. 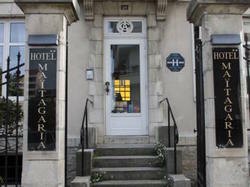 The hotel offers modern accommodation and has ocean views. Guestrooms at Maïtagaria come with a private bathroom. Modern facilities include free Wi-Fi access and a flat-screen TV. Biarritz offers opportunities for water-sports and walks along the Atlantic coast. During the summer there are concerts on the beach and jet-ski competitions. The hotel is just a 2-minute drive from the train station and 10 minutes from Biarritz-Anglet-Bayonne airport. Public parking is available onsite. This quadruple room has garden view. The room features a flat-screen TV, views of the garden , and the private bathroom is complete with a shower and toilet. This triple room has a view. This room has a view and a private bathroom.